Today we went to the Grove so Hailey could run around. Our first stop was in the ginormous American Girl Doll Store where Hailey spent a very long time admiring the fancy displays. They even have a photo studio there, along with a doll hospital for repairs, a salon where they (the dolls) can get their hair done or ears pierced, a cafe, and special party rooms. 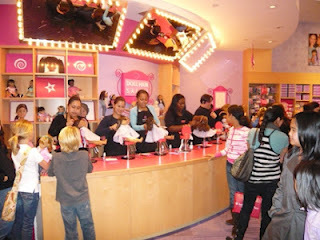 As you can see there is no shortage of parents willing to shell out the $20+ it costs to have your doll's hair styled. 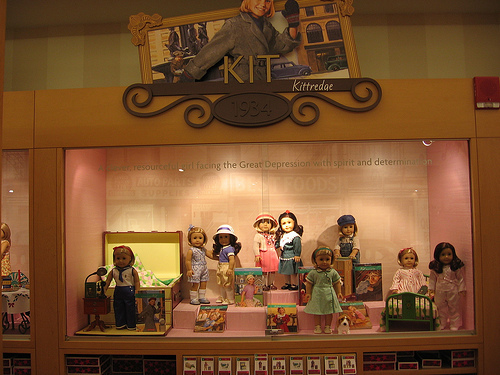 I think the dolls that come from the historical sets with books series are a great way to learn about history. The dolls run $105 a piece! Good thing you can buy them on ebay for alot less. Their clothes cost more than Hailey's. I saw people in the store dropping money left and right, walking out of the store a good $500 poorer. I even heard a woman tell her twins, "walk around and pick out anything you like!" We left the same way we came in: empty handed! Outside, Hailey just wanted to run around. That grass behind her was spray-painted green. That meant her sandals were green by the time we left. Evan had a good time too; he was snuggled up inside his Moby. On our way back to the car we passed the American Girl Store and it was closed. Hailey was pretty broken up about that. Hailey even got a treat before dinner.